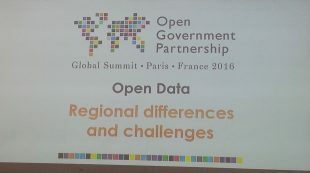 A few weeks ago, I’d never even heard of the Open Government Partnership (OGP), but I recently found myself attending the OGP Summit 2016 in Paris from 7–9 December, talking about #OpenDefra, along with Mike Rose and David Buck. Turns out the OGP is a big deal. It was established in 2011 to support governments around the world as they try to be more open, transparent and accountable. In five years, the OGP has grown from the 8 original member countries (the UK was one of the founders) to 70, and this Summit attracted 3000 delegates from governments and civil society groups around the world. The UK is particularly keen to promote itself as being the most transparent government in history, to lead on anti-corruption and to show its ongoing commitment to Open Government. The UK delegation included ministers and staff from the Cabinet Office, Foreign & Commonwealth Office, Department for International Development, and Defra. 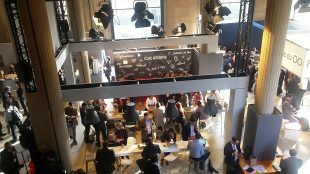 The Summit included official business sessions of the OGP as well as hundreds of panels, workshops, pitches and a hackathon. Read on for some of my highlights. This session drew me in with the opportunity to hear a global perspective, and my head was quickly swimming with open data facts and figures. I learned that while most Latin American countries have signed the Open Data Charter, Canada and the US have not. South East Asia lags behind on FOI, most notably in Malaysia where federal government information is restricted by the Official Secrets Act. No Sub-Saharan African country is in the top 40 of the Open Data Barometer. 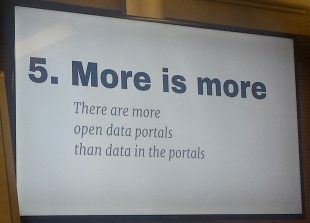 Familiar themes and issues abound, with everyone agreeing on the need for more standardised infrastructure and metadata, and a holistic, not scattershot, approach to making data open. Another good discussion in this session was the potential effect of burgeoning populist movements around the world and the impact that may have on evidence, science and data. That populism theme was carried over into the next session, where Joel Gurin from the Center for Open Data Enterprise in Washington DC discussed their Open Data Transition Report for the next US Presidential Administration (it was written before the election!). The US has made much progress with open data under the Obama administration, but most of the policy has been written via Executive Order, without Congressional approval, and is therefore subject to easy reversal. I also learned about France’s Open Labs movement, e.g. La Paillasse, the first open community lab in France, which aims to bring together scientists, citizens, activists, researchers, experts and the curious to work in the open and collaborate, using facilities which range from a biotech lab, hackspaces and a textile workshop. After hearing the speakers we broke up into randomised groups (cultural lesson learned: not everyone is familiar with the system of counting off by assigning everyone a number from 1–4). 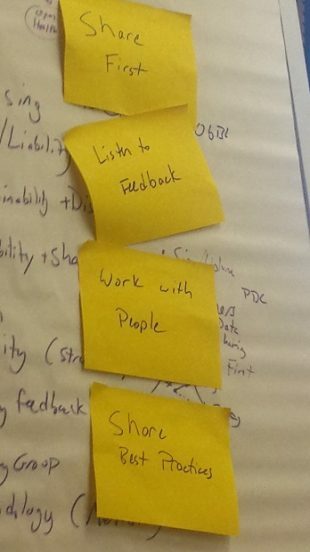 We had time to discuss what we thought the big issues are – our group filled every inch of our flipchart paper but managed to nicely summarise the main points into four post-its. Presenters from Romania, Italy, Tunisia and Argentina discussed how Open Data can support accountability and anti-corruption measures. Argentina’s main newspaper, La Nacion, has an autonomous data team who support the newsroom in research, e.g. a major investigation to disclose the declarations of assets and interests of government officials in that country. Romina Colman, an FOI specialist for the team, made the point that some true open data formats (e.g. CSV) are not easy for non-techy people, including some journalists, to work with. Defra has a wide remit and data is intertwined with everything Defra does, and every aspiration it has. 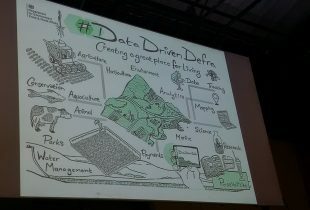 #OpenDefra had its chance to shine on Friday afternoon, when Mike Rose, David Buck and I did a session on how Defra released 10,000+ datasets in one year. (Lesson learned for the next conference: try NOT to get assigned a workshop room in a satellite venue that’s a five-minute walk away from the main conference hall…. And if possible, avoid the 2.30pm after-lunch slot!) Despite these logistical setbacks, our select audience got the opportunity to not only hear from us but to engage, ask questions and share experiences. There were lots of practical questions about metadata, portals, influencing, etc. and we came away with some new contacts. So, about that session on how to fail at open data. Of all the dozens of workshops, pitches and panels, that was the one I circled first. Andres Snitkovsky (Argentina) led a participative, crowd-sourced panel that highlighted failures on both the government/publisher side and the civil society/user side. Some of these failures are familiar, either because we’ve made these mistakes or we’re aware that we could. For example, releasing spreadsheets with hidden columns (which can be easily unhidden) or accidentally releasing personal data. Others illustrate examples I hope we never make, e.g. 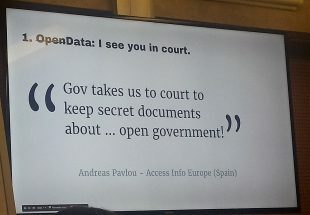 governments not releasing reports on….open data. 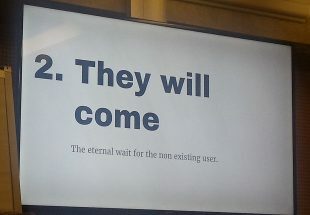 On the user side, there are the mistakes of making too many bespoke portals for open data and the ‘if we build it, they will come’ assumption. Great, provocative session, and refreshing to focus not on successes but on what hasn’t gone well. 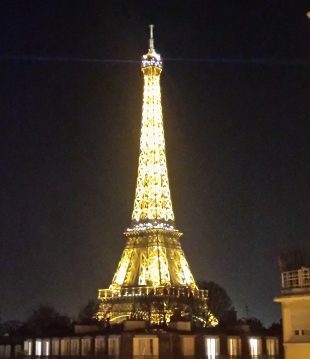 I came away both exhausted and exhilarated by the OGP Summit. It was exciting to feel part of a larger, global movement on Open Government and open data. It was reassuring to know there is more commonality than difference in what we’re doing in the UK and the rest of the world, both in terms of successes and struggles. And of course it was great to be able to shout a bit about what Defra achieved in 2015–16. Those of us who worked on making 10,000 datasets open know how hard that was, and having an international audience keen to ask us how we did it, was quite gratifying!